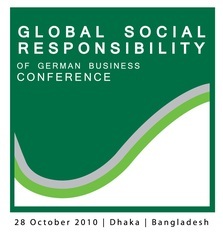 On 28 October 2010 the Bangladesh German Chamber of Commerce and Industry in cooperation with the German Embassy and the Deutsche Gesellschaft für Technische Zusammenarbeit (GTZ) held a conference on "Global Social Responsibility" in Dhaka. Over 300 representatives from Bangladesh and German companies as well as prominent participants such as Minister of Commerce Faruk Khan, Nobel Laureate Muhammad Yunus and Dr. Michael Otto discussed strategies and best practices for companies to address social and environmental challenges. 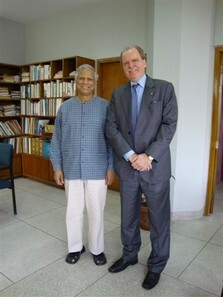 Professor Yunus presented his concept of "Social Business", calling upon the private sector to find solutions for social and environmental problems. Everyone could launch a "Social Business". Professor Yunus illustrated his experiences in establishing "Social Businesses" with international partners (for example BASF) and presented new projects he pursues with the Otto Group, adidas and Solarworld. Within our economic system, there are currently two prevailing approaches to organizations. The first is that of the private sector where companies sell products or services to make money. However, there are important issues in our society which are not addressed by the private sector because they do not offer profit-making opportunities. This usually leads to government interventions to create legal and institutional frameworks to advance the common good and to protect the interests of weaker members of society. Where both governments and the markets reach their limits, charities may fill the gap. The problem is, of course, that the system does not work well enough. We live in a world of terrible injustice and widespread poverty. Governments and charities have the will to improve it, but they lack the efficiency and innovativeness of the private sector. So why not combine the two sides? Let's bring the methods of business to the task of solving social problems such as poverty and create - social businesses!